Things have been a little slow on the Surface Pro and Windows tablet front the last couple of weeks, but that should all change beginning next week with the big reveal from Wacom, the eventual release of Samsung’s ATIV Q, Windows 8.1 and eventually the Surface 2. In the meantime, I’ve been spending the last couple of weeks with my new favorite software Manga Studio 5, trying to learn the ins and outs of 3d modeling for it. Don’t judge me for focusing on 3d in a paint program, but I just naturally gravitate towards the least documented aspects of any software I use. All the digging and trial and error are just forms of procrastination to avoid real work. Smith Micro is currently in talks with Manga Studio’s Japanese developers Celsys about whether to publish their new Clip Studio Modeler software as an English language companion product or add-on to Manga Studio. The software is currently available as a free beta from the Celsys site and a user has published a rudimentary English translation if you’d like to check it out for yourself. Clip Studio Modeler beta - Coming soon to Manga Studio family? 3D is a huge, complicated and frankly messy subject matter. Once you understand the basics and know where to find the features you need in a particular tool it’s not so bad. But the moment you need to move content from one application to another, you can be opening up a hornet’s nest. I’m going to try to keep this series of posts as simple and generic as possible. I will point to some specific tools that I use, but you should be able to reproduce these steps with just about any 3d software. Each tool has its strengths and weaknesses, but it all generally comes down to personal preference and budget. Some of this will sound like math and I’m very sorry for those of you whose minds turn to mush at the very thought of math. With a paint program like Manga Studio, you’re accustomed to working on a two-dimensional plane that can be described by a horizontal (x) dimension and a vertical (y) dimension. 3D adds a perpendicular plane that defines the vertical (y) and depth (z). In the image below, the ground plane is lying on the x (horizontal) and z (depth) plane. Each side of the cube is composed of one quadrangular polygon or face. Each quad is defined by four vertices. The quad polygon can be subdivided into two triangles. Each vertex can be identified by its x, y and z coordinate. There are two types of 3d materials or objects to consider: static or articulated meshes. As its name indicates, a static mesh doesn’t have any moving parts and is probably what you will import most often. Examples of static meshes are props, scenery and backdrops, like a pencil, a desk or a classroom. Articulated meshes, such as the 3d characters included in Manga Studio, have moving parts that you can pose. Every 3d software writes its own file format, but a couple of these formats have been around long enough to become “universal.” The most common of these is OBJ. Because this format goes all the way back to the dawn of computer animation, it is the most basic. OBJ models contain no animation information and are always static. An OBJ file is simply an ASCII text file that lists the x, y and z coordinates of every vertex (v) in a mesh. You’re not going to need to edit an OBJ file except to determine the name of its material library. 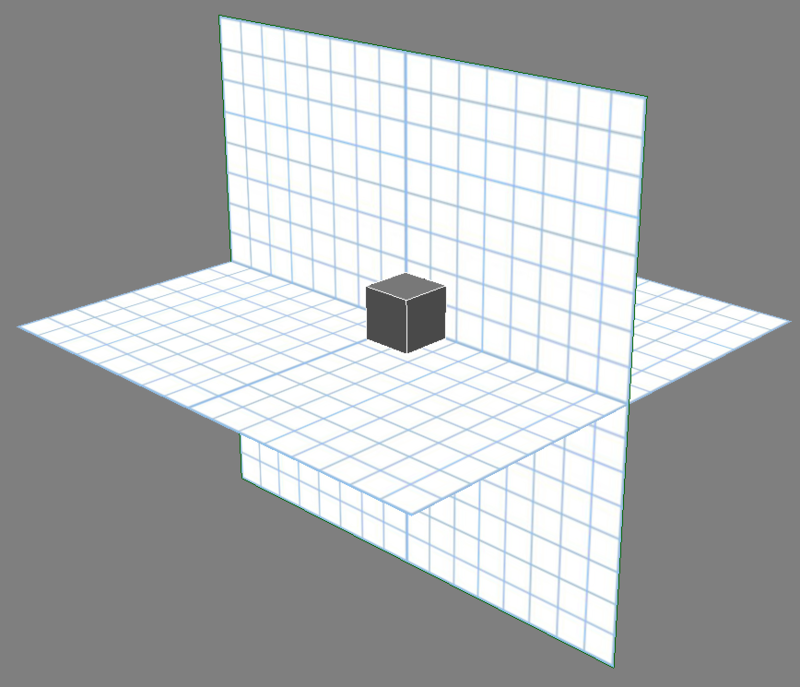 In the cube example above, the mtlib associated with the mesh is called cube.mtl. Manga Studio will allow you drag an OBJ file directly onto its canvas, but without an accompanying MTL file, the mesh will render as a solid gray with no textures. Unfortunately, while there are many thousands of free OBJ files available for you to download online, they often don’t have an MTL file. For these files, the only way to apply materials is to load them into a 3d program, add color and textures and re-export them with a new MTL file. Newmtl defines the name of the material applied in the 3d application. In the above example, it’s Softimage’s default scene_material. In this example, the scene_material has been replaced by material. This example has two materials: one named “red” and another named “map,” which is applied to one sub-group, or cluster of the cube (Polygon_XSIPOLYCLS). The most important entry to note here is the map_Kd item, which identifies the name and location of the texture required by the map material. When you download an OBJ and MTL, you will also need to download or recreate any image texture files referred to in the object’s material library. 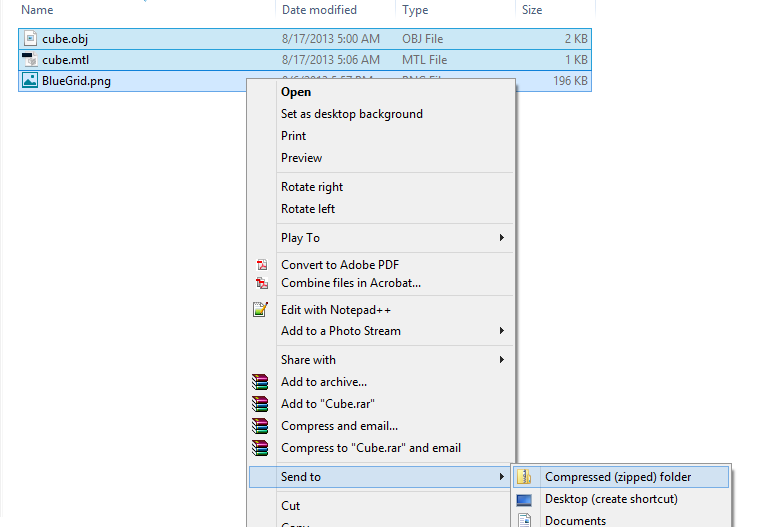 Texture files must be zipped in the same folder as obj and mtl files. Make sure that mtl is edited to reflect this path for textures. When importing into Manga Studio, the obj, mtl and textures should all be zipped in the same directory. You will need to edit your MTL with a text editor to reflect this. In other words, if the map_Kd entry above read textures/BlueGrid.png, you would need to remove the reference to the textures folder. The diffuse texture is an image file that determines the color of faces to which it is applied. If the diffuse texture referred to in an MTL file is missing, the corresponding faces that use that material will render grey. Manga Studio doesn’t understand any references to specular, bump or other common textures. Make sure to edit those out of the MTL file or your object won’t render properly. So now that you know a little about OBJs and the way Manga Studio interprets their materials, you should be able to import any static mesh you create or find online, using the process I wrote about here and that MS artist and trainer extraordinaire Doug Hill demonstrated in his video here. FBX, short for Filmbox, was a format created for the importation of 3d objects for motion capture. Filmbox was purchased by Autodesk who market the product as Motion Builder. The FBX format is constantly being updated and has become the de facto standard for sharing data between 3d applications and game engines. The problem with FBX is that it is managed by Autodesk and is not an entirely open standard. Developers (including some within the Autodesk family) are always having to play catch-up with semi-annual releases that often break the previous version. FBX can be such a hassle that sometimes a file that plays perfectly in one application will look badly mangled or worse refuse to load altogether in another. As an example, when I first started writing this post, I thought I would use the free DAZ Studio 4.6 to demonstrate the creation of FBX files, but the files it currently generates are not compatible with the recently released Autodesk FBX Review, which I discussed here. I'm not saying that FBX is totally broken. Depending on the source, it does work, and Manga Studio understands it, but I’ll save that for another article once I’ve found a reliable pipeline that is also affordable. If you’re modeling your own character to pose, it may take some effort, but every 3d application will eventually generate a flavor of FBX that Manga Studio will be able to read. If you’re not a modeler or can’t invest the time to build a character from scratch, you’re not entirely out of luck. There are many free and paid sources of 3d models online, including Turbo Squid, TF3DM, Creative Crash, and many others. This site has a nice list of over 60 such destinations. http://www.hongkiat.com/blog/60-excellent-free-3d-model-websites/. Whether a mesh is available for free or paid, there Is no guarantee that it will work without some intervention on your part. Quality varies widely and products produced over the years may no longer be 100% compatible with current tools. In the example screenshots below, I used a Spider-Man mesh that I found on TF3DM, but it was composed of several different objects that I needed to combine. It also had specular and bump maps that I discarded. Had I kept them in the file, the mesh would render as grayscale. Assuming you have found an OBJ you like, cleaned up its MTL file and accompanying textures and gotten it to load correctly in Manga Studio, the next step is to make it poseable. To do this in a 3d application, you create or bring in a pre-made skeleton (rig) and attach or skin it to your mesh. Every software does this differently, so you will need to research this on your own. For those of you who don’t own a 3d app or want a shortcut, there is a free (until September) option. Mixamo is a service designed for game artists who want to quickly apply motion captured animations to their game characters. In addition to working with already rigged meshes, Mixamo also features an amazing auto rigger that works great and is absolutely free to use for the next few weeks with meshes under 10,000 polygons. If your OBJ, MTL and textures have loaded correctly, you'll see your textured object here. After you create an account, upload your zipped OBJ, MTL and textures to the auto rigger. Markers assigned with symmetry on. You will then assign markers to define the object’s chin, wrists, elbows, knees and groin. Mixamo automagically will do the rest. To test the results, you can see your mesh performing various animations, including an all-important rigging stress test. Above is a screengrab of the rigged Spider-Man mesh performing a standard run. If you’re happy with the results, you can download the resulting FBX file for free. Simply zip up your Mixamo FBX file and its corresponding textures and drag this archive onto Manga Studio and you now have a working poseable character. Mixamo is a great service and is obviously a huge timesaver for professional game artists. Unfortunately, it’s All-Access annual plan is quite expensive for only occasional use. I recommend taking advantage of the remaining weeks of free availability and I will research any other low cost alternatives I can find. If you know of any, please leave a comment in the section below. One obvious alternative is the free and open-sourced Blender. This is a very robust application that should be able to handle the entire 3d modeling, texturing, rigging, skinning and exporting process for you. However, it can be quite daunting to learn and I've never taken the time to use it. If any of you are Blender users and would like to contribute a post or video, I and the entire Manga Studio community will thank you. So there you have it: more than you probably ever wanted to know about 3d, OBJ and MTL and a simple, free (for a limited time) way to get poseable 3d characters in your Manga Studio projects. I'd like to do more of these types of posts in the future, but I'd really appreciate your feedback on how basic or technical to make them. I look forward to reading your reactions and seeing how you apply these 3d assets in your upcoming Manga Studio projects.